Like all major technology revolutions, the cloud brings with it the mysticism of new technology, the fear of the unknown, and the opportunity to master a whole new set of challenges. It can be awesome and scary at the same time- provisioning servers in minutes instead of months, automation that can replace whole teams, and whole new security attack vectors. First, let me assure you- the underpinnings of IT technology have not changed. We have hardware layers, operating systems, and application layers, just as we always have. The cloud's ability to commoditize and abstract more of those layers just means we shift our focus up the stack higher- to areas where we can have more broad impact across our organization and our company, with less effort. 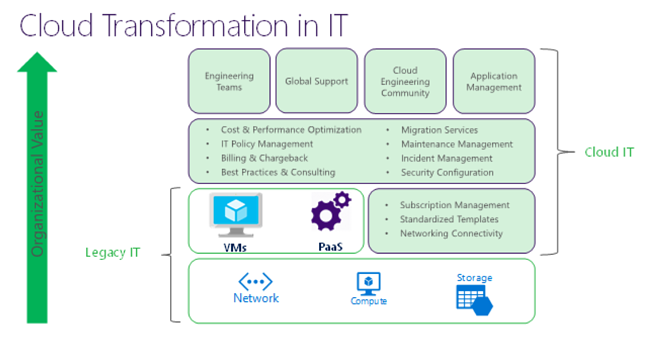 While going to the cloud might feel like outsourcing large portions of your IT portfolio- in actuality, it is allowing you to tackle very high-value technology work, like creating cloud engineering best practices, defining your PaaS and SaaS strategy, and adding even more abstraction into your platform. The more automation and abstraction that can be safely added, the more organizational scalability and impact you drive! The IT organization has entirely new levels of value to drive for the company. No longer are we stuck with resolving tickets and building out racks of hardware, or endlessly patching- now we are defining the future of how software is built and delivered to end customers. The challenge is- how do you climb this ladder quickly and safely? Automation and abstraction can be a double-edged sword. Here are some of the best practices I've found to be the most profound for unlocking that cloud value. You've probably built your career on skillfully managing on-premises environments made up of hosts, VMs, storage arrays, and network components. In fact, you probably spent quite a bit of your time in the order and setup process- where you were largely incentivized to order hardware larger than the immediate need. Over time you learn that being an IT rock star involves projecting a strong 5 year lifespan for each hardware order, and provisioning it for the what ifs- so that way, 3 years down the road, your organization doesn't hit a total brick wall on performance or capacity. This rock star trait, unfortunately, does not carry over to the cloud very well. Instead, flip that same concept on its head- provision for one month, or one week, performance needs, and become a champion to your organization of the power of changing VM sizes on demand. Even moving down one SKU size in the cloud can cut costs in half- and upsizing is just a few clicks, or an automation engine, away. Uptime has always been a tightly held prized goal for rock star IT engineers. Five nines, the penultimate goal for services, has required years of extremely diligent architecture, planning, and investment. Your non-production workloads have probably often benefitted from the upgrades and planning done to implement five nines in your production spaces as well! And I'm sure developers, testers, and engineers all over have loved the nice, cushy experience of always having their servers available whenever they want, however they want. 24x7 uptime has become part of everyone's normal expectations. Become a champion of "Only on when you need it." Because the cloud providers bill by the hour, the old expectation that my servers are available to me when I have insomnia and want to run a build at 3 am is very costly. The more you can drive your organization towards being flexible on uptime hours for non-production workloads, the more money your organization can pull back and re-invest in new architectures, platforms, and cloud technology. Automation has long been the best friend of an IT rock star. It's becoming even more of a necessity, now that the cloud has given us a software defined layer of infrastructure. Become a champion of using automation wherever "software defined" is in play. Your VM templates, your IT policy, your network design, and definitely where performance and cost are in play. A real IT pro cannot reasonably resize, suspend, and apply policy across hundreds if not thousands of workloads in the cloud on a daily basis. You can stretch your IT Pro expertise across your entire IT organization with savvy automation. I've seen firsthand how automation of sizing and suspensions can save untold millions of dollars for organizations in the cloud, and it's the hallmark of a true "Cloud Rock Star." Taking your rock star IT skills into the cloud requires being a leader and an educator. The cloud can be unsettling to IT organizations- leading the way by showing its immense value and the opportunity to turn the IT organization into a revolutionary solution provider instead of a legacy rules-based standardization organization is key. The greater agility, elasticity and scale of IT in the cloud requires a new generation of rock stars. Generating momentum by creating other cloud rock stars will help you drive your organization into a new age of information technology solutions for your company, and for the world. Check out our on-demand webinar!